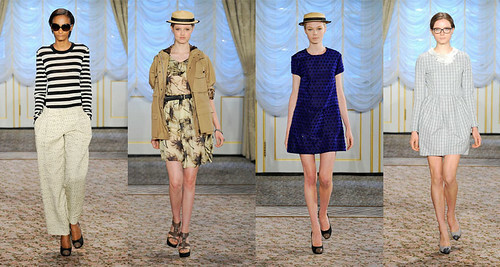 ADORED VINTAGE: Jason Wu Resort 2011, Could I Be Anymore in Love? Jason Wu Resort 2011, Could I Be Anymore in Love? Coco Chanel-esque straw boater hats, I simply adore it! I actually have a vintage straw hat which I plan to wear more often during the summer. There is something so very chic and French looking about all of these looks. If this is the future of mainstream fashion then I will take an extra double helping and go back for seconds! Je l'aime beaucoup! I love the simplicity of it and the vintage feel.